If you walk through Vienna′s first district, the inner city, you will find innumerable little churches in a range of styles, but mostly Baroque ones (at least their façade will be in that style). One of these churches is the Dorotheerkirche, which is unusual - it does have all the features of the rather pompous Southern-German and Bohemian Catholic Baroque, but it is a Lutheran Church. Most Lutheran churches in Austria are very modern, usually very plain and far from the splendour-laden extravaganza of a Baroque, Catholic building - so what has happened with the Dorotheerkirche? The Dorotheerkirche was originally a simple, monastic church and belonged to Clarissian nuns - a nunnery called the "Königinnenkloster" or "Queen′s Nunnery". Ever since the counter-reformation, the Habsburgs were fierce enemies of Protestantism and banned all Lutheran activities as much as they could (there are still remote areas, mostly Styria, that were never fully re-reformed). Once religious warfare ceased towards the end of the 17th century, things became more relaxed in terms of stakes, torture and expulsion. Protestant ambassadors and noblemen were even admitted to Vienna. Under the rule of Empress Maria Theresia, the practice of Protestant prayer and certain kinds of worshipping were allowed. Her son, Emperor Joseph II, released the "Toleranzpatent" that allowed Protestants, Orthodox Christians and Jews to officially run churches and synagogues. Limitations on such venues were strict (read more on this era in my articles on the history of Austria). 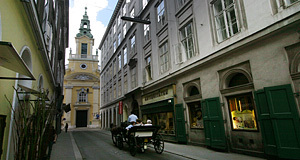 However, they coincided with another move of Joseph II: The dissolution of hundreds of monasteries - including the small nunnery of the Clarissians in the Dorotheergasse Lane. The interiors of the nunnery were sold to various parish churches, the monastery itself became a domestic Palais - and the church was bought by the Lutheran community of Vienna in 1782. There was only one problem: A Protestant church (or an Orthodox one or a synagogue) was not allowed to look like one from the outside. In the case of the Dorotheerkirche Church, it already looked like a church - which made it the only obvious site of non-Catholic worship in Vienna for decades. By the way, if you make it to the Stadttempel, the main synagogue of Vienna, they will tell you the same story here - only that the Stadttempel is actually not recognisable as a religious building from the outside for this very reason. The Lutherans didn′t change a thing about the outside of the Dorotheerkirche for a long time. The inside, however, was re-modelled according to Protestant aesthetics (ie none): The Neoclassical interiors were designed in 1783 by the imperial court architect Gottlieb Nigelli and are about as exciting as Protestant churches go (ie not at all). And now the punch line: In 1887, Protestants now enjoyed full citizen rights and religious freedom, the Lutheran community of Vienna suddenly decided to mess around with the façade, too. They added a neo-Baroque façade on the tower in the style of what looks to me like a Catholic church from around 1700 - god knows why. Ayway, one claim to fame of the Dorotheerkirche is the tomb of the Count Niklas of Salm, one of the glorified defenders of Vienna during the first Turkish Siege in 1529. His remains were later transferred to the Votivkirche, where they still enjoy much appreciation from the touristy lot. Attractions nearby the Dorotheerkirche are considerable: The Hofburg with the Albertina, the National Library, the Augustinerkirche and other attractions. The Jewish Museum only two houses down the road; the Palais Lobkowitz - also two houses, but into the other direction - with the Austrian Theatre Museum. The Spanish Riding School and the Neuer Markt Square. To name but a few. It is in central Vienna, after all, where pretty much every buildings has a long story to tell.